Hello everyone. I got the exciting news that I was the Grand Prize Winner of WhisperWood Cottage 2011 1st project of the year party! The winning entry was my spackled candlestick project shown below. One prep tool and paint brush kit from Purdy. How great is this? Now, this is where I need your help. I would love a pretty soft white wall paint from Dutch Boy. Something with no yellow undertones and not a stark white. I haven’t decided which rooms to paint yet but I am leaning toward the living room. This room gets lots of light from four windows. I know many of you are paint experts so any help is appreciated. Even if you haven’t used Dutch Boy, but have a white paint you love, please let me know. Maybe I can get a similar color. Congrats on your win! How exciting. I'm sure you will get some great advice about white paint. Nothing white here, but I am so happy for you!!! This is a great project and you made these look FANTASTIC!!! Congrats to you Sherry!! Those candlesticks are great. As far as paint color, not sure. I have only painted the dining room an ivory and this paint looks so different in different lights. It is called swiss coffee by Behr and is very light with gray undertones, but my daughter says that is the color in her master bath and it is so brown looking in there with lack of light. So excited for you! How great to win such a wonderful prize. I am looking forward to seeing what you do with all your new paint. Congratulations Sherry on your fantastic winnings! I also love your candlestick creations. As for selecting a wall color, I am no good at it! My walls are in Pratt and Lambert's manor white, which is a creamy white with yellow undertones. I know there are a lot of bloggers who will send some suggestions your way. How fun! Congratulations Sherry! Love that project. Congratulations! I really liked your candlestick revamp. Sorry, no ideas on the Dutch Boy though. Oh, Sherry, I wish I could help! I've been trying to decide on the "perfect" white color for one of my guest rooms and I think I've narrowed it down to Sandy White by Benjamin Moore. Of course, I also like Natural Choice a Behr Ultra paint. I also like Antique White and Najavo White….so you see I'm no help! I think it's just a personal matter and you might have to get some sample pots and try painting several colors in your room to see what works for you. I have no idea about the paint color – but i'm coming back here to see what colors are suggested. this big old house i moved into last summer has yellow tones to all the 'white' walls and i don't like it, either. then there is the dark green walls in the dining room…way too dark! Congratulations! I don't have any advice on paint, but just wanted to say "well done!" I`m here first time, but I`ll back. Your blog is creative, very interesting, just beautifull!! Best Regards, have a very special week and Thank You! P.S. This project is GREAT! Congratulations on your win! 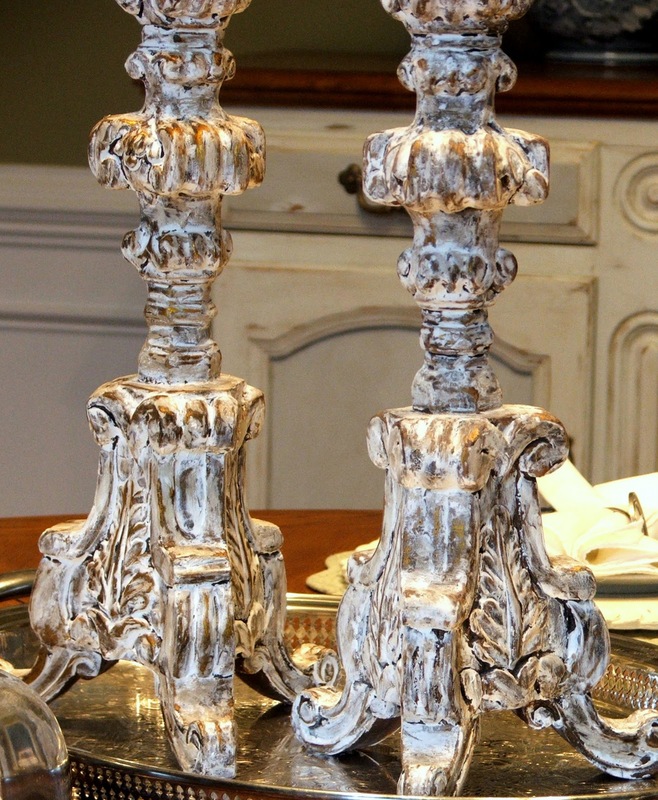 These were my very favorite too….no advise on white paint, but I know what you choose will be perfect. Congratulations on your win, Sherry! Love those candlesticks. Wish I could help you find a Dutch Boy paint color. 🙁 I use "Wedding Veil" by Ben Moore and Sherwins William's Zurich White (at 50%) but they might be too white for you. They are white white but not cold. On the chip, zurich white has a slight gray undertone compared to regular white but it isn't noticeable unless you put it beside bright white. In my voile curtains post & mantel post, the white paint is what's on the trim and fireplace. White is tough. Good luck, sweetie! Congrats to you! Those were definitely winning candlesticks! I have no idea on the paint, I would suggest checking paint swatchs everywhere with all brands until you find what you like then have them match it! Congrats again on your fantastic prize! Well…I am no help at all. I actually mixed a touch of black in my white paint…LOL….The kid at the paint store thought I was nuts. Congratulations on your win Sherry. Those candlesticks are fabulous. Congratulations! Those candlesticks turned out great~you deserved to win!